Darkfield microscopy (also known as Live Cell Analysis/Microscopy) is a simple and useful technique of analyzing blood from a patient for information about the terrain (i.e. acid/base balance), the immune system, nutritional status, and the state of various microorganisms. A darkfield microscope produces an image with a dark background and looks at live, unstained, and unfixed blood, unlike the conventional light field microscopy or electron microscope. Without stains and fixatives, the picture reveals a continuum rather than a moment in time. It allows the ability to view blood in its mobile nature (i.e. 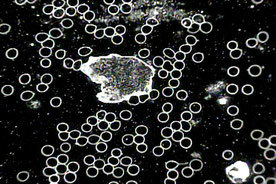 red blood cells and white blood cells floating in the plasma), and even microbial (bacterial and fungal) activity and their different forms. Professor Gunther Enderlein, a German zoologist and physician, discovered several fundamental concepts in understanding the nature and biological cause of disease. These concepts include: the “Pleomorphic Theory,” which states that each microorganism (bacteria and fungus) undergoes a life cycle where one can see changes in shape and behaviour; the fungal element protit, not the cell, is the smallest biological unit in human blood; the existence of two microorganisms within the blood of all mammals: Mucor racemosus Fresen and Aspergillus niger Van Theigen; within the blood, these microorganisms can change form depending on the individual’s body terrain or environment, and can ultimately affect the body’s normal processes to promote a variety of diseases. Live cell microscopy can reveal the health of a person’s blood cells, which in turn reflects nutritional status, especially low levels of iron, B12, folic acid, proteins and fatty acids. It can also assess the health of certain organs, such as the liver, kidneys, and digestive tract. The Darkfield Microscope is considered an experimental device valid for research purposes only. No claims regarding diagnosis and/or treatment are made with this device. At M2HNC, we use live cell microscopy to assist in the assessment of an individual. Patients can see first-hand the health of their internal environment.